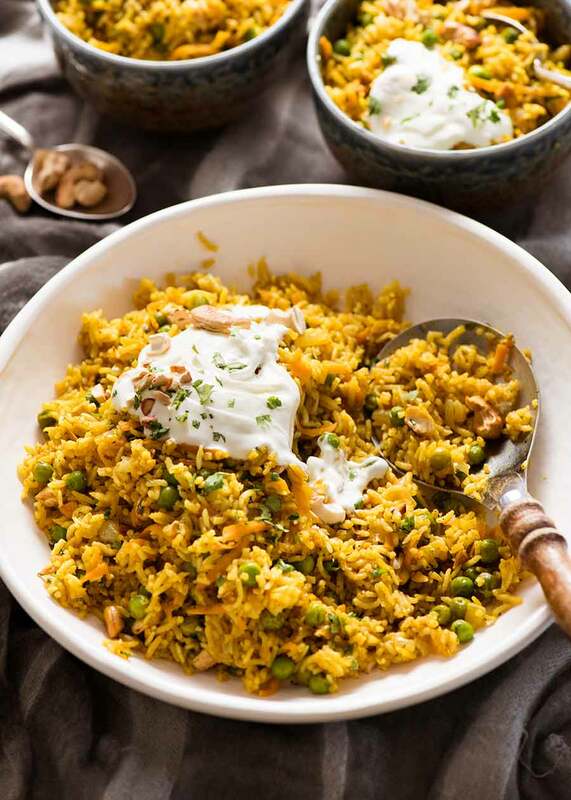 A really great Curried Rice that won’t disappoint! 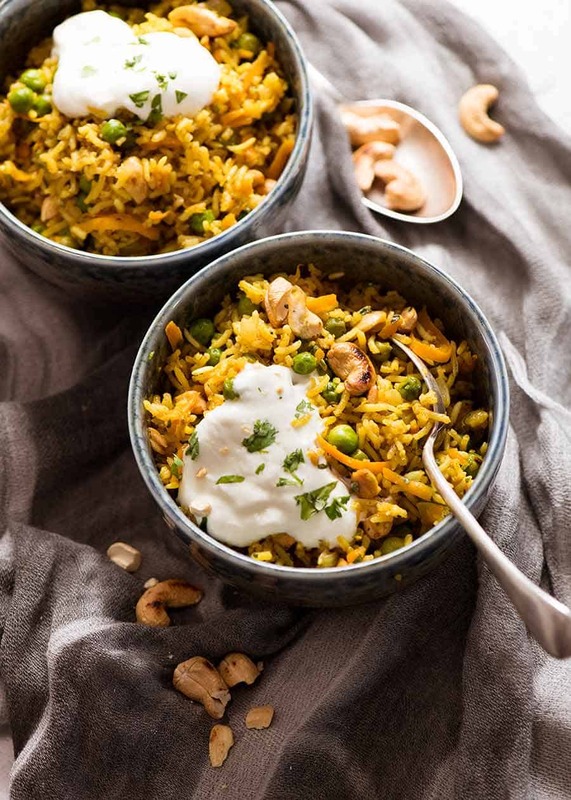 This pilaf-style fluffy basmati rice recipe is flavoured with everyday curry powder plus extra spices to give it a punch of flavour. With sweetness from carrots and peas, a sprinkle of cashews and a garlic flavour base, this is a rice side dish that will jazz up any meal. Or serve it with crispy fried eggs for a super quick meal! Curried Rice – think of the possibilities! And in that shorthand note I left with the food, I’ve just hit up all the high points about this recipe. I should do that more often! 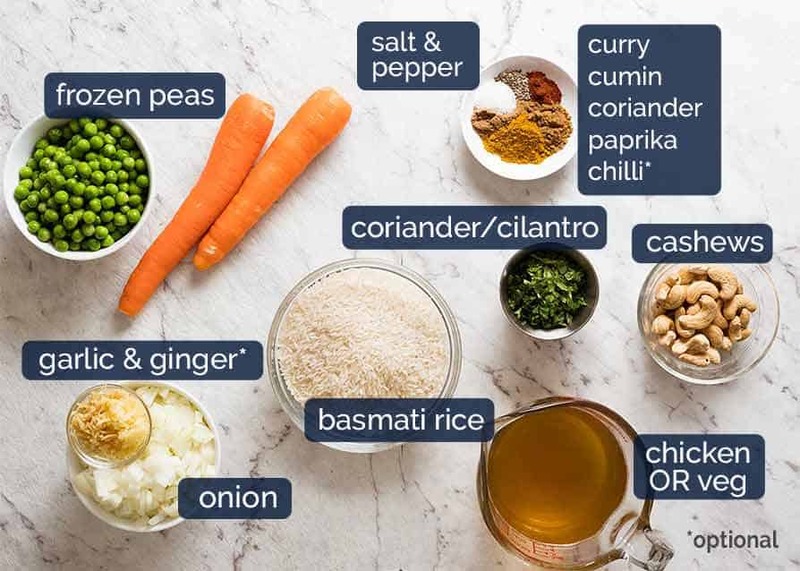 This recipe calls for a few more spices than just Curry Powder because I find that things made with just curry powder tends to lack flavour for my palette. So I pimp up the curry flavour with a few extra spices – cumin, coriander and paprika, plus chilli powder for spiciness which is optional. 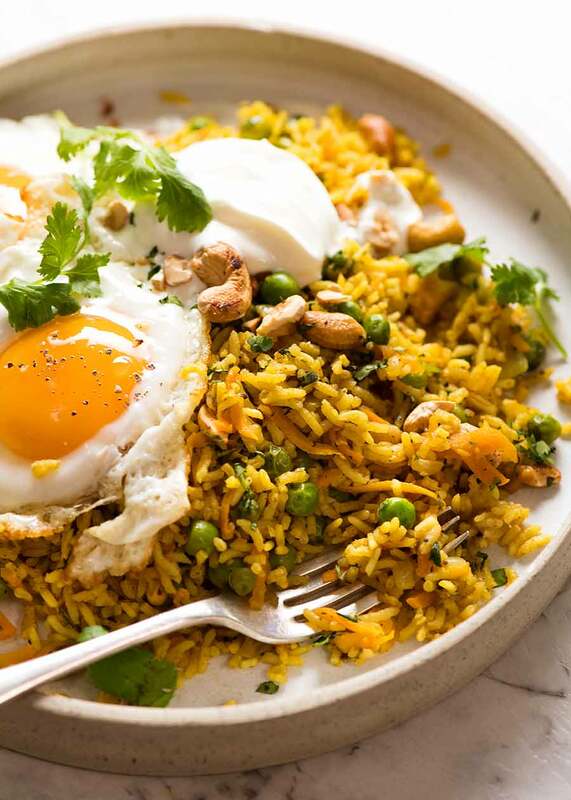 This Curried Rice is a basmati rice recipe because it’s on-point. The nutty flavour is ideal for the flavours in this recipe, but there’s plenty of other rice options that I’ve covered in the recipe notes. 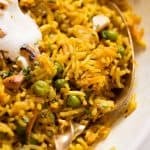 I added grated carrots and peas for extra flavour and texture – they add sweetness which really elevates this from your usual pilaf recipe. Plus cashews and fresh coriander/cilantro. Look at these ingredients. You know this is going to be a winner! This recipe starts like any usual pilaf, sautéing aromatics – in this case garlic, ginger (optional), onion and carrot. After this, the raw rinsed basmati rice is added, the spices, then chicken or vegetable broth/stock. When there are bubbles across the entire surface of the liquid (not just around the edges of the pot), clamp the lid on, turn the heat down to LOW and cook for 14 minutes. No peeking! Remove from heat and rest undisturbed for 10 to 15 minutes. The rice continues to cook and absorbs any residual liquid. Fluff with a rubber spatular NOT a fork (breaks the long grains), marvel at how soft yet fluffy the rice is, and serve! Why do you rinse the basmati rice? You don’t usually do that! That’s true, most rice recipes on my site do not call for the rice to be rinsed! Basmati rice is the exception for 2 reasons: firstly, it’s imported (to be Basmati, it needs to be grown in certain regions in the Indian subcontinent) so I prefer to clean it myself. Secondly, basmati is the “driest”, least sticky of all rices and rinsing the rice removes excess starch so the grains don’t stick together when cooked. In contrast, rices for Asian dishes are meant to be a bit sticky so it’s easier to pick up with chopsticks. Trying to eat basmati rice with chopsticks is a challenge! Dollop of plain yogurt – essential! Melt butter in a small to medium pot (or large saucepan) over medium high heat. Add garlic and ginger, cook 30 seconds. Add onion and cook for 2 minutes until partly translucent. Add carrot and cook for 2 – 3 minutes until softened and sweet. Add rice and stir to coat all the grains in the oil. Add Spices and mix to coat the rice. Add broth, peas, salt and pepper, stir. If any rice is protruding above the surface, poke it under the liquid. When the entire surface of the liquid is simmering, stir once, place lid on and immediately turn heat down to LOW. Cook for 14 minutes, do not peek while cooking! Lift lid slightly and quickly tilt pot to check to ensure liquid has been absorbed. Clamp lid back on and remove from heat. Stand for 10 minutes, undisturbed. Add most of the cashews and coriander, stir through. Transfer to serving bowl, sprinkle with remaining cashews and coriander. See in post for serving ideas. 1. Curry powder – Use HOT if you want it spicy, or mild if not. Use any curry powder – not intended to be a full on authentic Indian recipe. I’ve used all the major brands sold at Australian supermarkets (Keens, Clives, Hoyts, Masterfoods) and they’re all tasty. 2. Chilli powder – this is pure ground chilli, for spiciness so adjust to taste. Chili powder in the US is a spice mix that’s not very spicy. If you can’t get pure ground chilli powder, sub with cayenne pepper. 3. Ghee is clarified butter used in Indian cooking. Tastes like rich butter. Not essential in this recipe. 4. 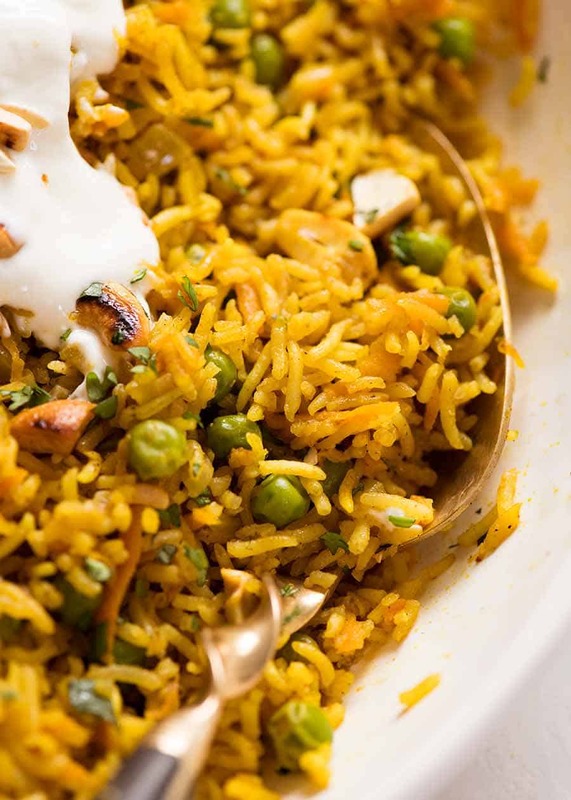 Rice – basmati is ideal for this recipe, the nutty aroma adds to the overall flavour. Can also use other plain white rice – long grain or jasmine (best subs), medium*, short grain* or sushi rice*. Not suitable for: Brown rice, black rice, wild rice, paella, or risotto rice. Not tried with quinoa. * Rice is stickier, such is the nature of those rices. How I rinse rice: Either place in colander and run under water for 30 seconds, moving rice about with your hands, until water runs pretty clear. Or do this in a bowl, swishing rice around and changing water 4 times or so. Drain rice well before using. No need to soak rice for this recipe – I found it didn’t make a difference to fluffiness. 5. Broth/stock – Be sure to use low sodium broth (stock), otherwise it will end up too salty. If you use a stock powder, bouillon cube or concentrate + hot water to make broth, then omit the salt completely. – Scaling recipe: If you scale down, be sure to use a smaller pot otherwise the rice won’t cook evenly. – Don’t use a fork to fluff basmati rice, it breaks the long grains. 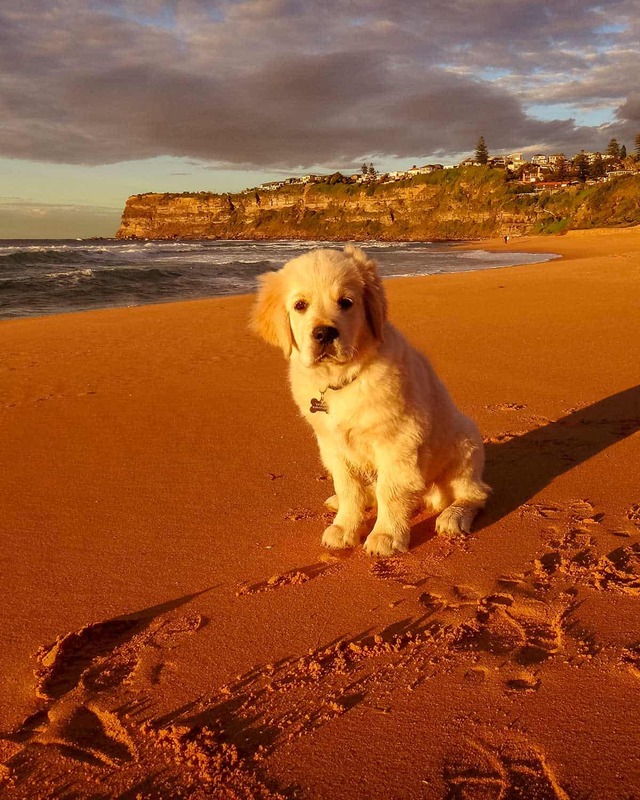 I shared this flashback Dozer puppy photo on Instagram over the weekend. It got more likes than my recipes do!! I’m so offended – he’s stealing my thunder! 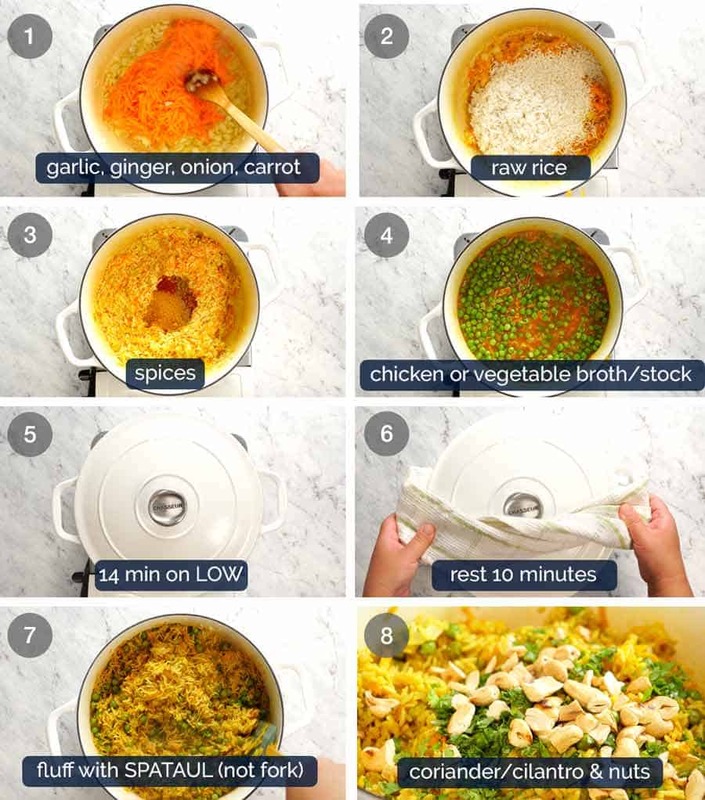 The post Curried Rice appeared first on RecipeTin Eats.